This week I take a look at one of the best-designed apps I’ve encountered all year – and it’s Canadian! 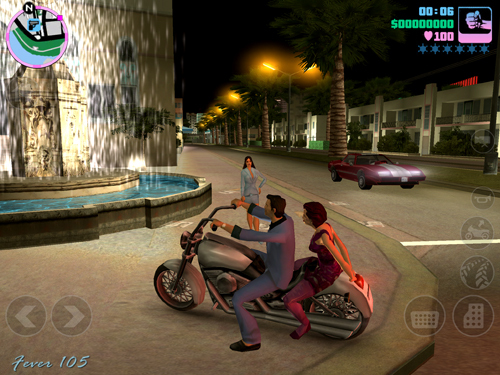 Plus Grand Theft Auto celebrates the 10th anniversary of Vice City with a new mobile version that manages to be better than the original and the Government of Canada issues an app for travelers. When a Miami crime boss decides to betray everyone he does business with he chooses lowly henchman Tommy Vercetti (Ray Liotta) to be the fall guy. To keep Tommy alive you must guide him through a string of situations-gone-horribly-bad and deal with outrageously paranoid characters played by Burt Reynolds, Dennis Hopper, Gary Busey, and Debby Harry amongst many other recognizable names. Yes, there are gun fights, but also pizza delivery challenges, tasks involving remote-controlled helicopters armed with explosives, and a great deal of time driving catering to the demands of a big wig’s spoiled daughter. Originally released ten years ago, this mobile version feel no different, keeping the scale and detail of its living city and the clever homages to the crime stories of Martin Scorsese (Goodfellas) and Michael Mann (Miami Vice). The 80’s music, the different radio DJs, and the cheesy synthesizer soundtrack are all there. The touchscreen controls take some getting used to, but the graphics have been given a nice polish while the options for saving your game in the cloud and using custom iTunes playlists help give this edition a mobile advantage. 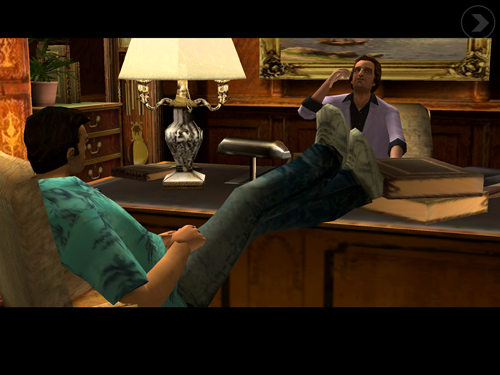 Time has passed, but Vice City remains a great game. Among the very best of this year’s iPad apps is this one exploring the incredible world behind the Stratford Festival. Impressively immersive, it uses a number of magical tricks to show off the many facets of theatrical production. Hold your iPad in landscape mode and the app becomes a beautiful art book where the focus is on gorgeous photography and engaging video clips, but then turn it to portrait mode and it becomes a manuscript filled with delightful anecdotes and stories. A panoramic view of the theatre gives you a sense of what it’s like to be on stage while digital fly-throughs of some of Stratford’s more complex sets let you control the rising platforms and lowered props of Henry V and Jesus Christ Superstar. 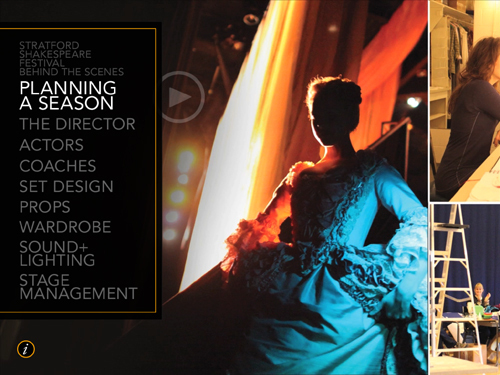 Animated slideshows take you through both dance and fight choreography as well as the transformation of an actor from street clothes to a character on stage. 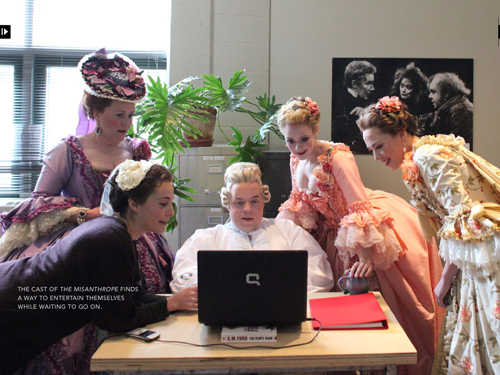 360 degree scans of props, wigs, and costumes, which are more detailed than their movie counterparts, offer up a hands-on sensation as you turn them about and examine them from all sides. Heightened with music and flowing transitions, it’s a wonderful tour diving into nine detailed sections, from acting and directing to props and wardrobe, to lighting and stage management. It is a prime example of what can be done creatively on an iPad. 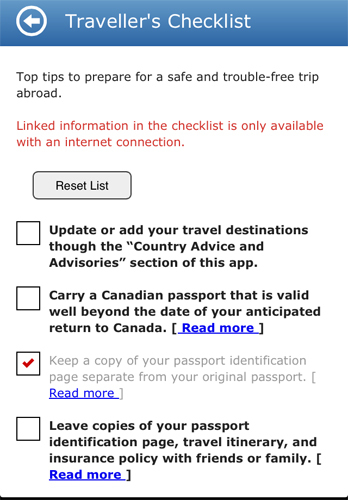 This is not an app you download from an online store, but rather one you load into your mobile web browser by surfing to the government of Canada’s website. You can use it to look up a country you’re planning to visit and retrieve the latest advisories, safety concerns, border requirements, and guidelines for navigating issues of health, law, and climate. Should you get into trouble outside the country it will connect you to government offices and oversea agencies, through both emergency hotlines and e-mail, that can offer guidance and help. 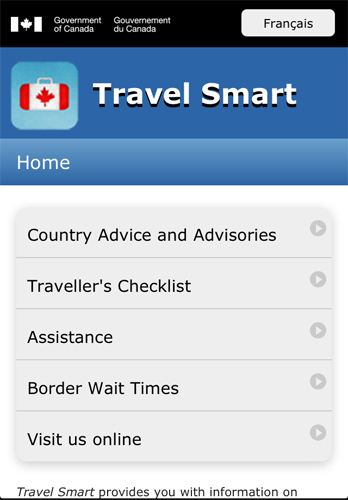 If you’re going to the US you can use the app to check the wait times for the different border crossing points and customs offices. It’s a simple app that’s well-organized and handy. The only downside is that you need to have internet access in order to use it, something most people lack when travelling.